In networked systems, a designer often has a higher level goal in mind which he wants to achieve with local rules. Examples of possible goals are rendezvous and formation control. This project aims to find general methods by which arbitrary global behaviors can be mapped on to local network interactions. Initial work has shown that global linear transformations can be computed using only local rules. 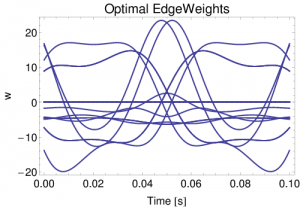 This is achieved by weighting the edges in the network with time varying weighting functions and letting the dynamics of the networked system evolve according to local weighted dynamics. Global transforms can come from simulation of the dynamics of another system. For a given linear system, the mapping of the state at some initial time to the state at a final time is computed by multiplying the initial state by the state transition matrix. So one can think of a the state transition matrix as a function applied to the initial state. 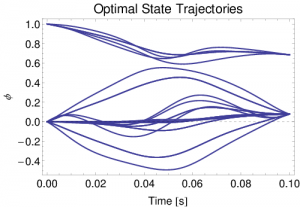 Since global linear transforms can be computed with local rules using this method, we can simulate any linear dynamics periodically by choosing the state transition matrix as the global function we are trying to compute. As an example, in the below plots, we simulate a dense graph running the consensus algorithm to converge more quickly than the underlying network would normally be able.